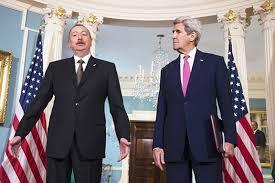 "Location explains Azerbaijan’s standing in the world. Situated on the oil rich Caspian Sea, the state is wooed by Western governments seeking an alternative to Russia as a source of energy imports. Israel is one such customer and in return sells large quantities of sophisticated weaponry to Azerbaijan, partly in exchange for oil." - Robert Swift, "Azerbaijan: Israel’s secret Muslim friend" Jerusalem Post, November 2, 2015. With Nagorno-Karabakh’s frozen conflict thawing its way back into the Western news, Canadians might be puzzled by this renewed battle between Armenians and Azerbaijanis – people about which they know or care little – over a tiny non-country. As if on cue, historians and post-Soviet political experts are pulling out their historical overviews and timelines, providing easily digested bites of background information suited to our era of low attention spans and divided attention. This information will explain how the Armenian-majority territory ended up included, as a bubble-like enclave, in Soviet Azerbaijan in the first place, just waiting to become a bone of contention when the inevitable “ancient hatreds” re-emerged to engulf the region as the Soviet Union collapsed. That war killed more than 30,000 people and resulted in virtually complete population un-mixing, with ethnic Azerbaijanis fleeing Nagorno-Karabakh and Armenia, and ethnic Armenians fleeing Azerbaijan, collectively producing about a million refugees, many of whom still have not been resettled more than two decades after the 1994 ceasefire. And, invariably, it will focus on the international legal environment that gave rise to modern-day “frozen conflicts” in the first place – the post-Second World War international prohibition on the alteration of borders by force, and the international community’s clear prioritization of territorial integrity over self-determination. After 22 years, the shaky Armenian-Azeri ceasefire in the Nagorno-Karabakh region fell apart overnight on April 2 with both sides of the front using mortars, artillery, armored vehicles, battle tanks and multiple rocket launchers. Azerbaijan also uses UAVs and helicopters. Baku and Yerevan blame each other for triggering the hostilities in the mountainous area. However, the most intense fighting on April 2 and April 3 were observed in Martakert (регион) where the Azeri troops were advancing on forces of the Nagorno-Karabakh Republic, an unrecognized state which is de-facto a province of Armenia. Title: Foreign Policy Diary - Nagorno-Karabakh Standoff: geopolitical struggle in the Caspian Sea region. Source: South Front. Date Published: October 2, 2015.